The leader in digital imaging, Canon has officially announced the next evolution in advanced amateur digital SLR photography – Canon EOS 50D (the successor to popular EOS 40D), which features 15.1-megapixel resolution, 3-inch Clear View LCD screen (920,000 dot/VGA resolution), improved noise reduction and Canon’s next generation DIGIC 4 image processor, aiming to offer extraordinary quality and image control for advanced photographer. “Advanced amateur photographers blur the line between the hobbyist and the professional, looking for professional features and capabilities in their equipment that will allow them to capture that awe-inspiring image. Canon is constantly striving to provide these shooters with the most advanced imaging technology, like the new EOS 50D Digital SLR camera, to fuel their passion for photography, and help them achieve their creative potential,” said Yuichi Ishizuka, senior vice president and general manager, Consumer Imaging Group, Canon U.S.A. 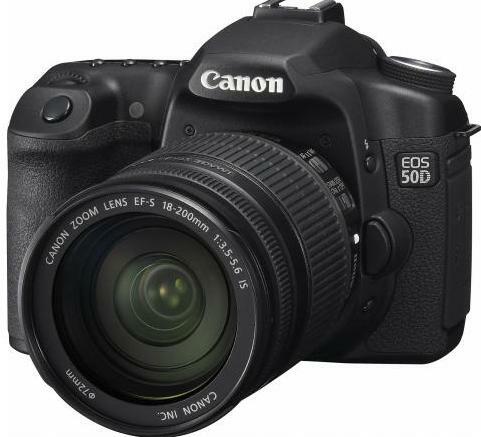 The new Canon EOS 50D Digital SLR camera that compatible with full lineup of Canon EF, EF-S lenses and EX-series Speedlites is expected to be available in coming October for $1,399 (body only) and $1,599 (with Canon’s EF 28-135mm f/3.5-5.6 IS USM zoom lens), respectively.